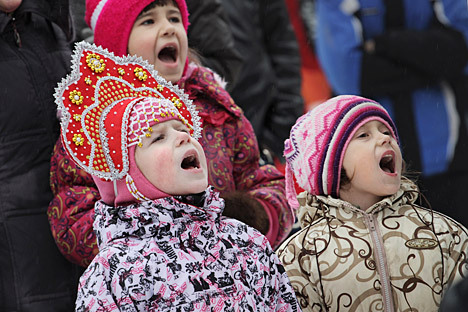 Long before karaoke was invented, singing at the table was an integral part of Russian culture. There is an old tradition in Russia – when everybody at the holiday table has already drunk enough and somebody starts singing a droning song, and then everybody joins with their uncoordinated voices. This tradition continues, and we have made up a list of all the most popular Russian drinking songs. A song about the Cossack ataman Stepan Razin, who lived in the 17th century and rebelled near the Volga River. In the song the ataman is complaining that he couldn’t sleep well and is singing about his dream. Sigmund Freud had not been born yet, so Razin is trying to interpret his dream using various people’s methods. This song was first written down by folk-specialists in the Ural region around the 1880s, where it was dictated by an old Cossack. Today it is performed by the ensemble Kazachiy Krug. This song is a request to the winter cold not to freeze the traveler and his horse while they are on the road, because his beautiful wife is waiting for him at home. It is as if this song came out of nowhere. The singer Maria Morozova-Uvarova had confirmed that she was the one who wrote it in 1954, but it has not been confirmed. It is performed by Valery Zolotuhin (from the movie Lord of the Taiga region). What does a new turn on the road bring us? What about a turn in life? We won’t know until we actually turn… One of the most popular songs performed by legendary rock-group Mashina vremeni (Time’s Machine). Music by Alexander Kutikov, lyrics by Andrei Makarevich - both are the group’s front men. This song is a Cossack folk song. The main hero compares his death to a black bird, which is flying in circles over his head. He is sure that if he sings this song, then his bad fate will give way to good fate. This song was first heard in 1934 in the movie “Chapayev” and sung by the actor Boris Babochkin. A lyrical song about a loved one. Music by Mikhail Zvezdinskiy, performer of criminal world songs and city art songs. Lyrics by Russian poet Nikolai Zabolotskiy. A song from the early 1980s about the tough lives of astronauts. The main idea is that it’s really great to be out in space, but nevertheless, at home it’s always going to be better. Even when we are far away travelling in the galaxy, we still dream about the grass near our houses. Music by Vladimir Migul and lyrics by Anatoliy Poperechniy. This song is performed by the group Zemlyane (Earthlings). Here is a rather interesting fact: In 2009 the Russian Federal Space Agency named this song the official hymn of Russian cosmonauts. This song is about the beauty of Russian nature, especially right before and after the sunset. The singer is nostalgic about Russia’s noble society of the 19th century, when officers drank champagne, women danced at balls and it was just great to be an aristocrat. This song was written in the late 1990s. Music by Alexander Dobronravov, lyrics by Victor Pelenyagre. This song is performed by the group Beliy Orel. Everything’s going to be alright, especially if you have some alcohol and then paint the town red. A song written by the Kiev-born actor and musician Andrei Danilko, who usually performs as his female comic character Verka Serdyuchka. In 2007 he finished in second place when taking part in the Eurovision contest (he performed with a different song). Songs about Moscow? Balalike it!